Start Early Program, Designed as an early intervention program for children ages 3 to 5, mentors working one-on-one strive to reduce the effects of mental health issues affecting the child. Through education and training, mentors help children use skills to increase their social and emotional development and academic performance. 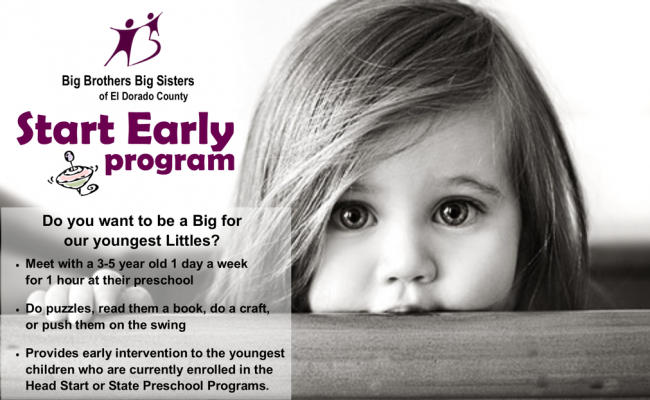 The Start Early program is designed to provide early intervention to the youngest children (ages 3-5) in the Head Start and State Preschool programs located in El Dorado County. Big Brothers Big Sisters of El Dorado County serves children who are considered “at-risk” as a result of poverty, living in foster care, having an incarcerated parent, living in a single parent or guardian home, or those who may experience or may be subjected to factors contributing to mental illness. Mentoring programs help children realize their full potential and build happy and healthy futures, thereby strengthening our local communities and societies at large. The goal of Start Early is to provide a very vulnerable population a consistent, positive role model that will be in their life for many years. The hope is that the matches made in the Start Early program will continue as the child grows up and transitions through school and the different stages in their young life. The child will utilize the skills they learn from the Big Brother or Sister to increase social and emotional development, and increase their academic performance and socialization skills. With the assistance from their Big Brother or Sister, the child will look at school as a positive, fun and exciting time in their life and not as a negative place to be.